This example shows how to acquire 16k samples of signal on fast analog inputs. Signal will be acquired when the internal trigger condition is meet. Time length of the acquired signal depends on the time scale of a buffer that can be set with a decimation factor. Decimations and time scales of a buffer are given in the table below. 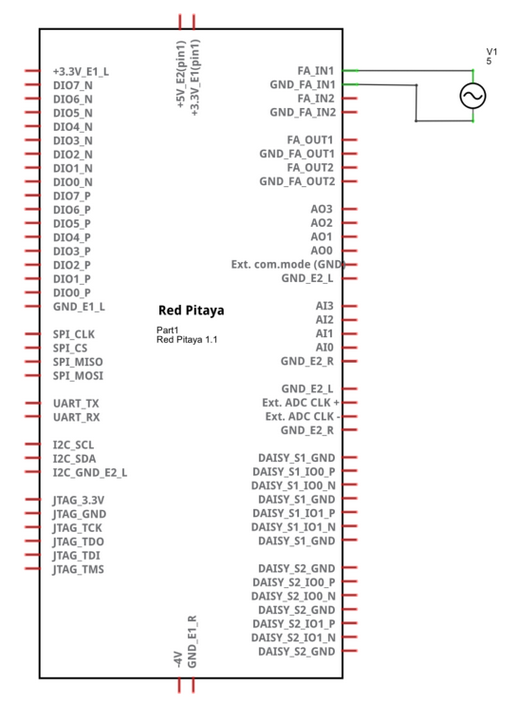 Voltage range of fast analog inputs on the Red Pitaya depends on gain setting that can be set by jumpers. HV setting is for input range to ±20V, while LV sets input range to ±1V. The code is written in MATLAB. In the code we use SCPI commands and TCP/IP communication. Copy code to MATLAB editor and press run. Scilab socket input buffer can read approximately 800 samples from Red Pitaya. This is the problem in contributed code for Scilab sockets. How to set socket is described on Blink example. // and 2 latest are empty spaces and last is “}”.